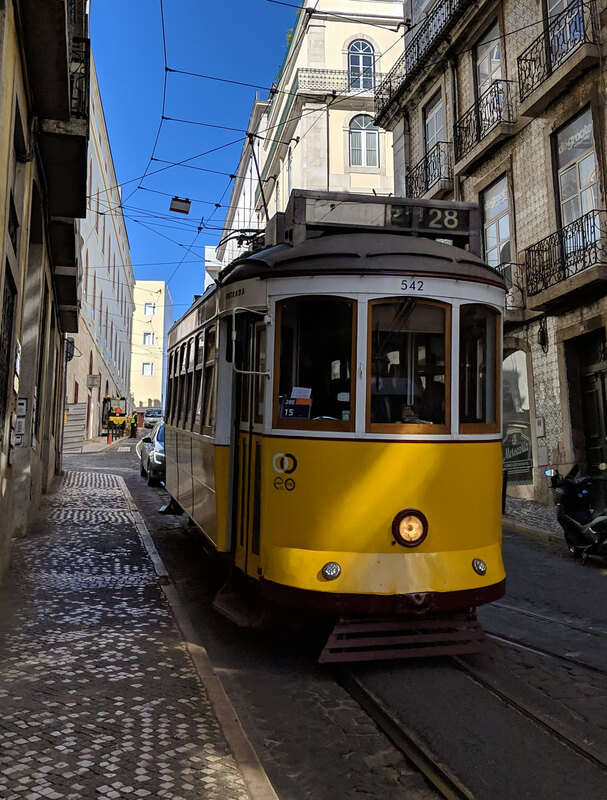 This page contains my photographs of the wonderful Lisbon trams and funicular railways. There are also links to my videos of the trams. 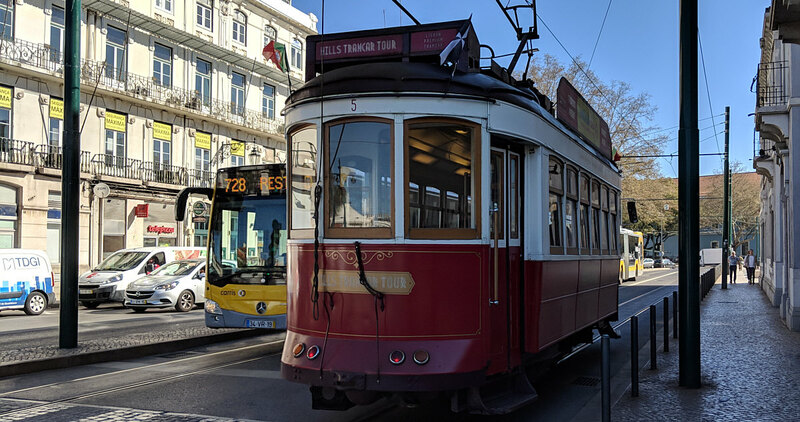 I've included a few facts about the trams and their routes as well as information that will hopefully be useful to anyone wishing to visit Lisbon. 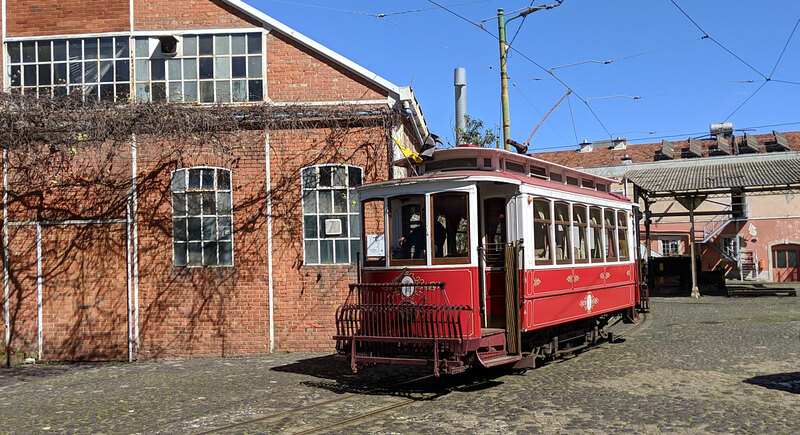 The website is in three sections, the first covers the trams, the second the funicular railways (or strictly speaking just one of them so far) and the third a few pictures of the transport museum. I hope you enjoy the photos, videos and find the information useful. 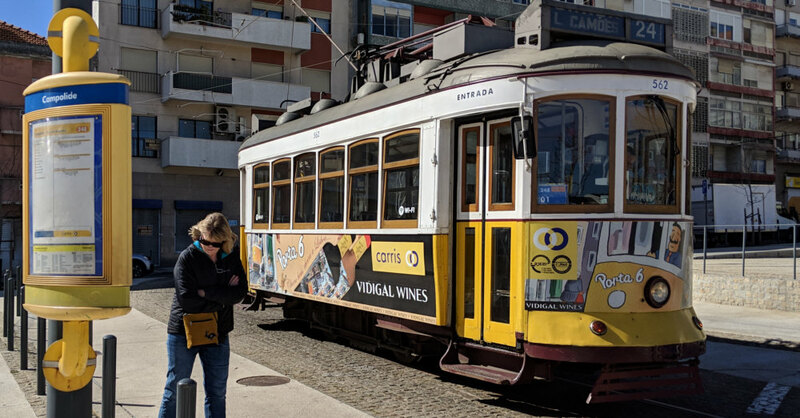 One of the 1940s Portuguese Remodelado trams. I have loaded a number of videos (in HD) to YouTube. Click below to open a video; they open in a new page. Close the page after viewing to return here. 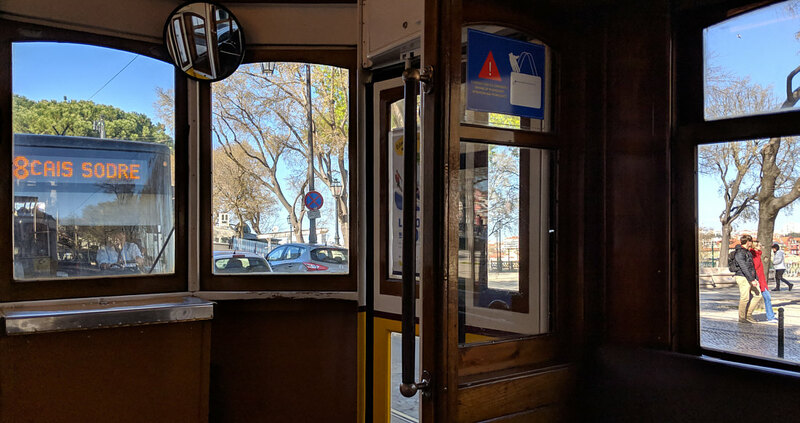 Part 1 of a drivers' view trip on a route 28E tram. Route 28E is the most popular with tourists. Part 2 of a trip on a route 28E tram. Continue the journey towards the Alfama district. Part 3 of a trip on a route 28E tram. 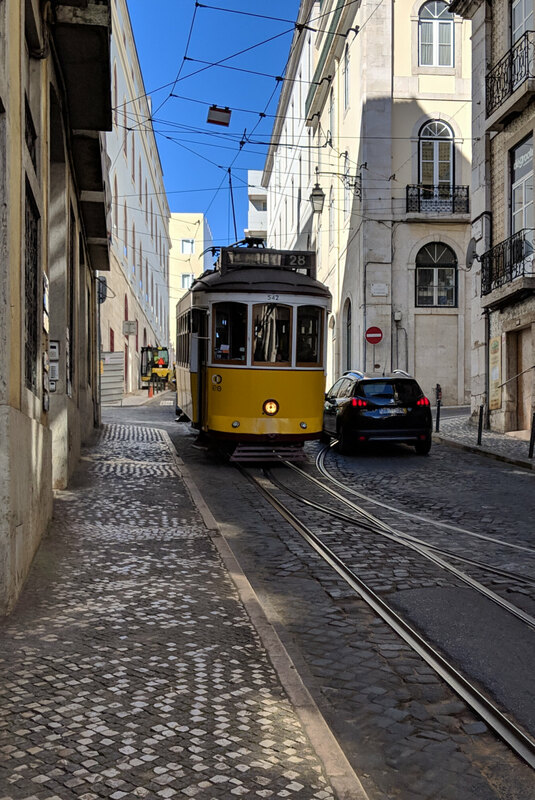 This section of the route is winding and narrow through Alfama. Part 4 of a trip on a route 28E tram. 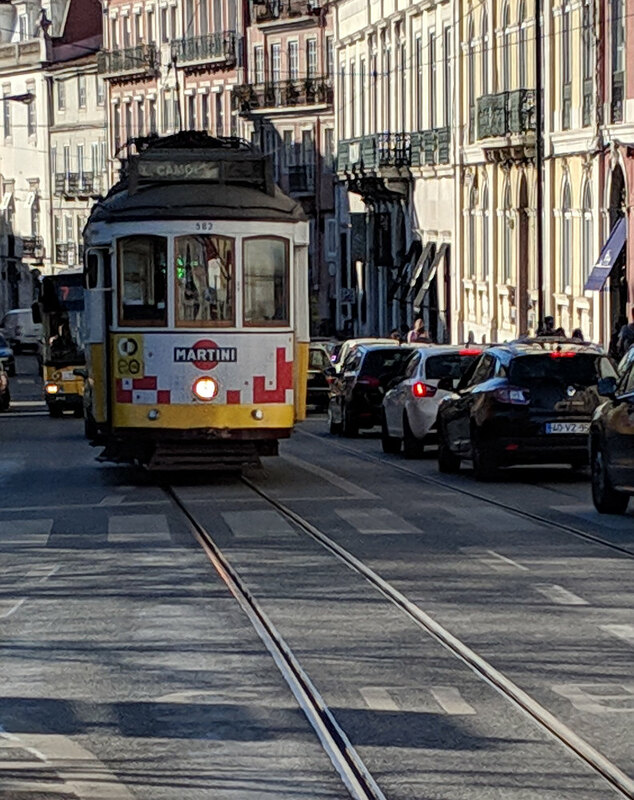 The route continues to Praça Luís De Camões near Chiado passing and following many other trams. 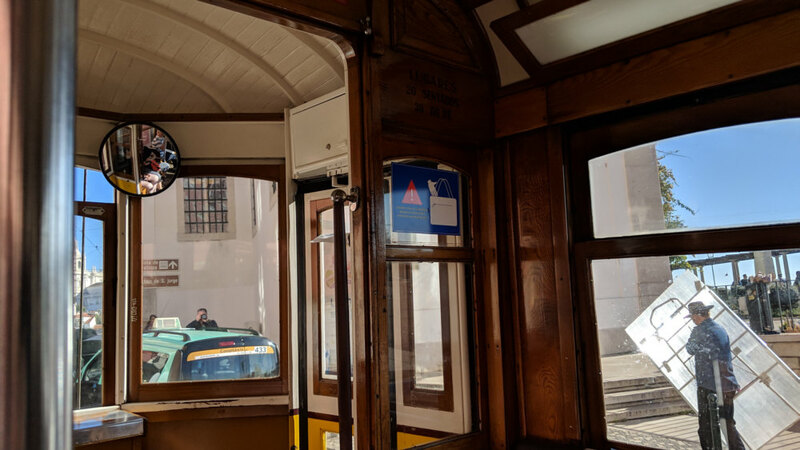 Lisbon tram drivers' view of the 'new' route 24 - this video shows the full route to Camões. 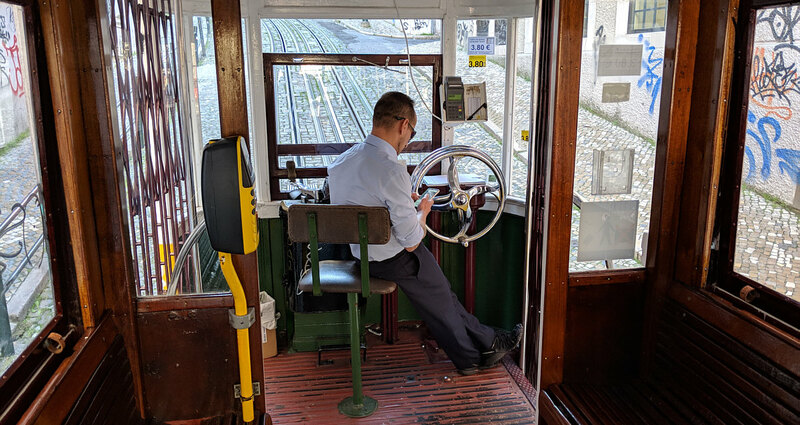 Take a drivers' view ride on Lisbon's "Gloria" funicular tram. View the "street art" although lots is plain graffiti. 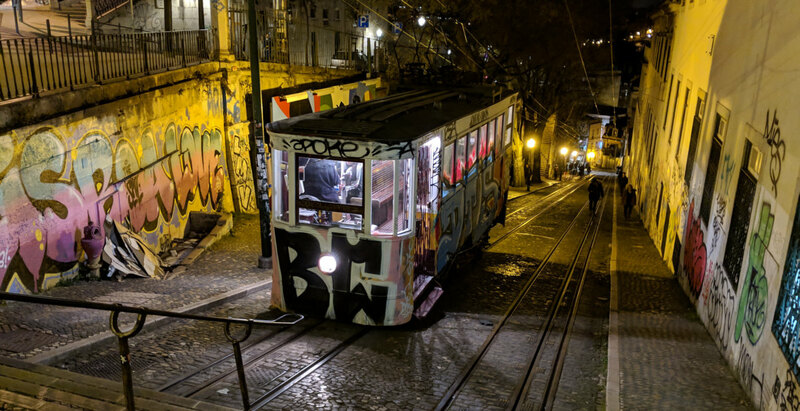 Lisbon's Ascensor da Glória funicular railway at night. A view from the bottom as the tram approaches. My YouTube page where you can access all my videos. 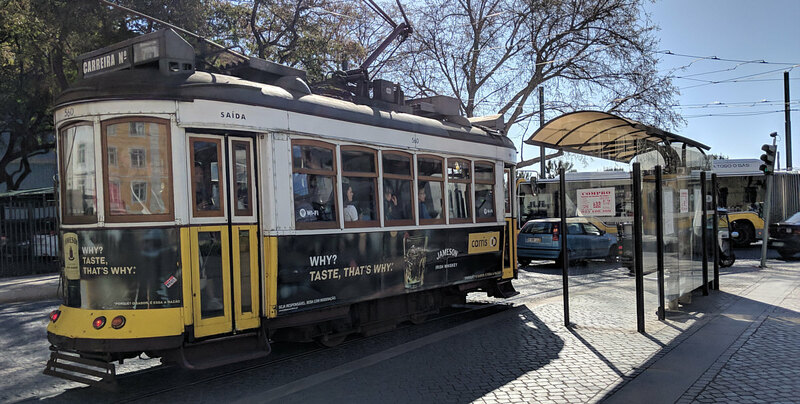 A brief history of Lisbon's tram network: The first tracks were laid in 1873 and the trams were pulled by horses; there is an example of these early trams in the transport museum. The system was electrified in 1901. I believe there's an old joke about the decision whether to use alternating current (AC) or direct current (DC). After experiments, the horses were found to run faster on Direct Current. 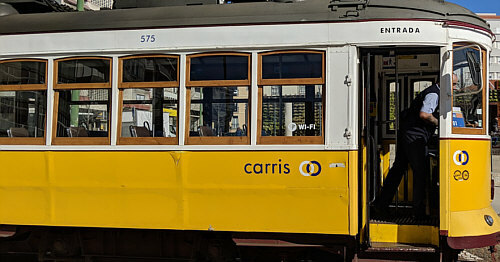 Seriously again, the electrification led to the Portuguese name 'Carro e létrico' or translated, "carriage with electricity" and later shortened to "Eléctrico". In fact this has been shortened further as the route numbers are suffixed with an "E' for Eléctrico. 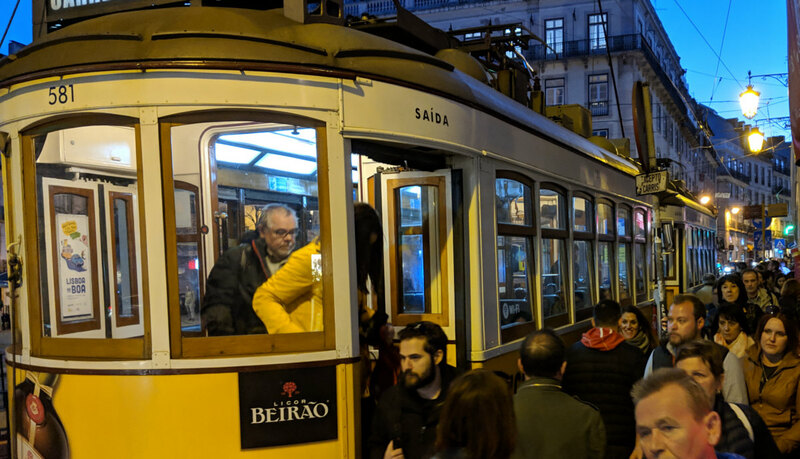 The system underwent a massive upgrade between 1936 and 1947 and it was at this time the remodelado trams (as in the photo above) were manufactured. At its peak in 1950 the network consisted of 76 km of track and there were 24 routes. Lightweight trams were later introduced (there are pictures in the museum section) but didn't survive the constant pounding from passengers and the network of hills and tight bends so when in 1990 there was another major reconstruction of the network, the historic remodelado trams with re-fitted with new engines, brakes and electronics. 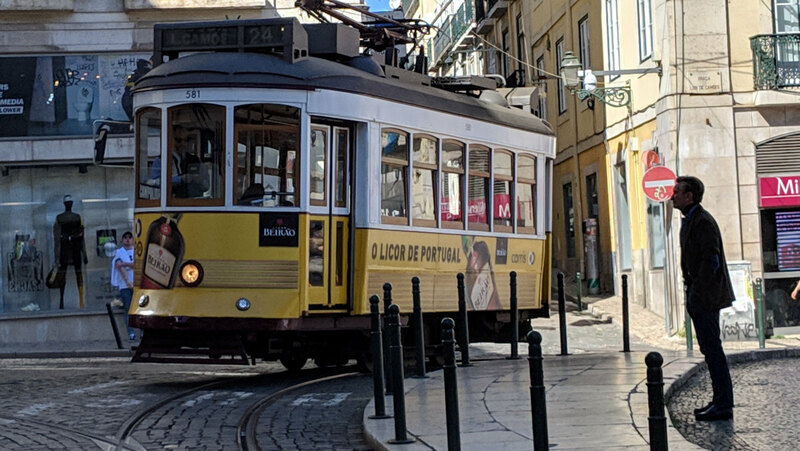 Since the design was now unique to the Lisbon tramway, the trams were re-named as "Portuguese Remodelado". I have created an animated map showing the development in the network between 1959 and 2018. 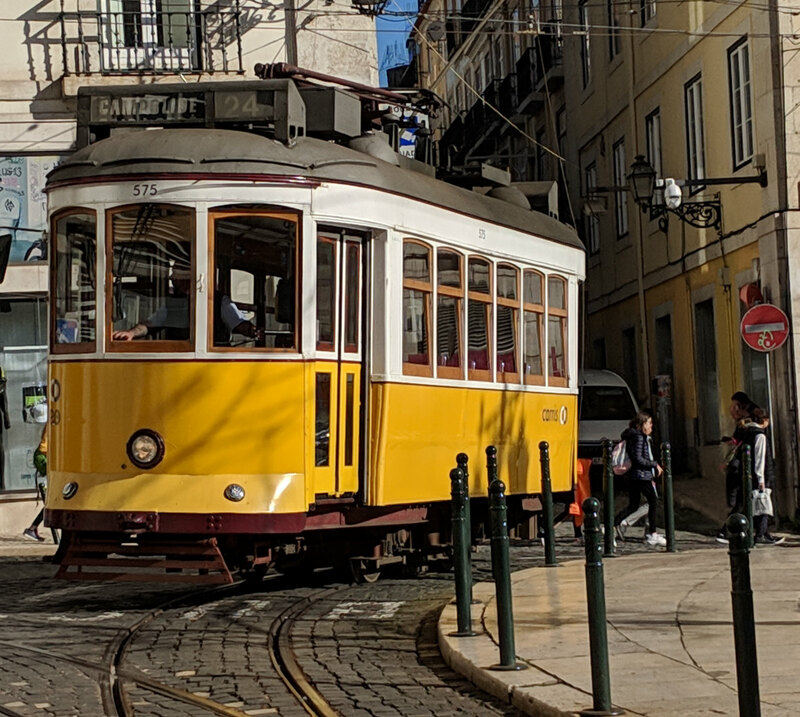 Over the years the network declined in Lisbon as in many cities around the world. It became common for selfish drivers to leave their vehicles blocking the rails and leading to long delays. 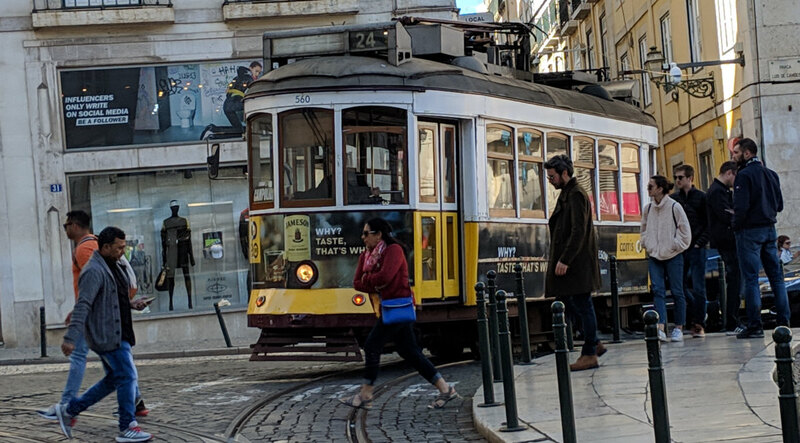 However trams have made a comeback in many places and in Lisbon the situation is better as the beautiful old remodelado trams were still running. In fact in the 1990 reconstruction, newer articulated trams were purchased for one route (15E). By this time there were only five routes remaining. 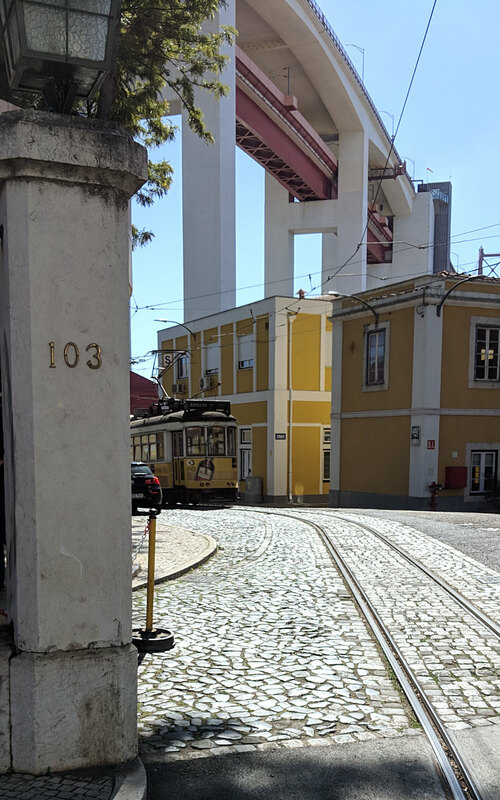 Other then the 15E with the articulated trams, the remaining four routes needed the remodelados due to the severe restrictions on space between the roadside buildings and the track in Lisbon's narrow streets and the extremely tight curves. 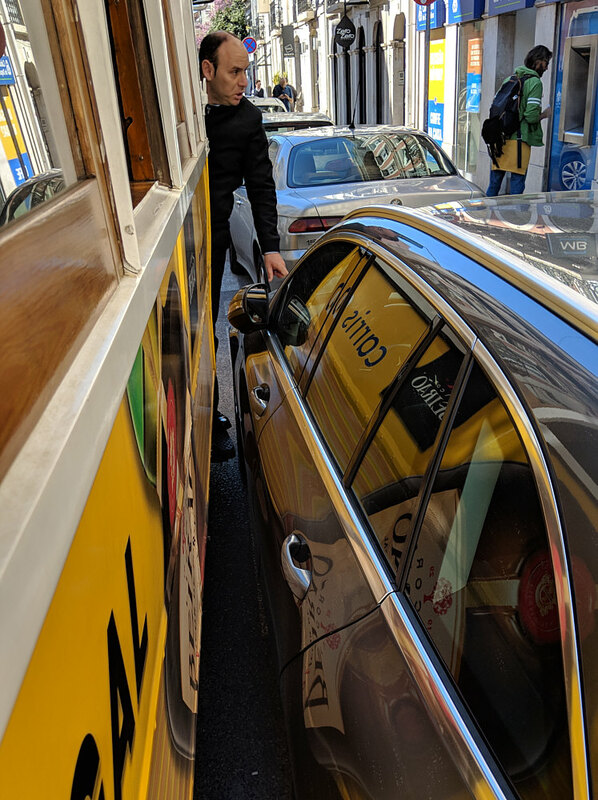 As a result the network is not only an environmentally friendly carbon free transport system but the photogenic trams are loved by visitors, tourists, enthusiasts and I believe local people as well! More good news in 2018, route 24E was re-instated having been suspended 24 years earlier. 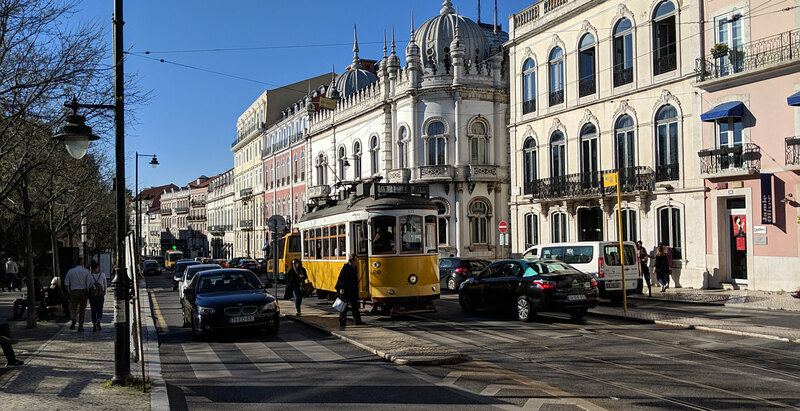 Route 24E first opened in 1905 was re-opened in April 2018 running from Campolide to (for the time being) Praça Luís De Camões where it connects with route 28E. 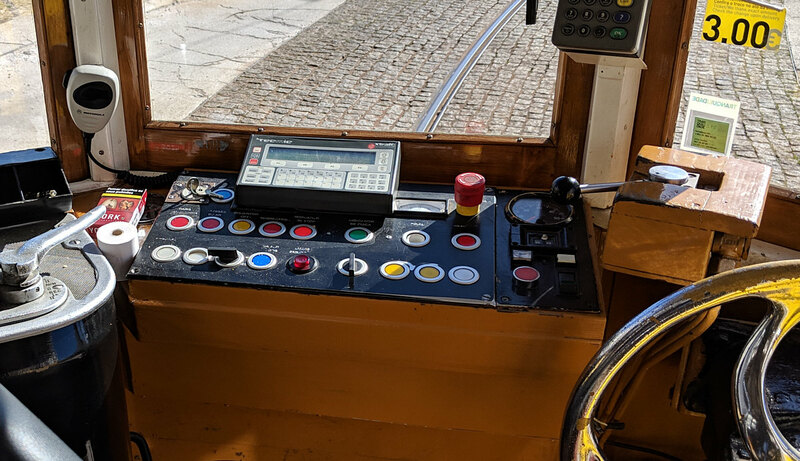 The route originally terminated at the Cais do Sodre and I believe that will be the final destination but at the time of writing (March 2019) there is still some trackwork that needs completing to complete the route. 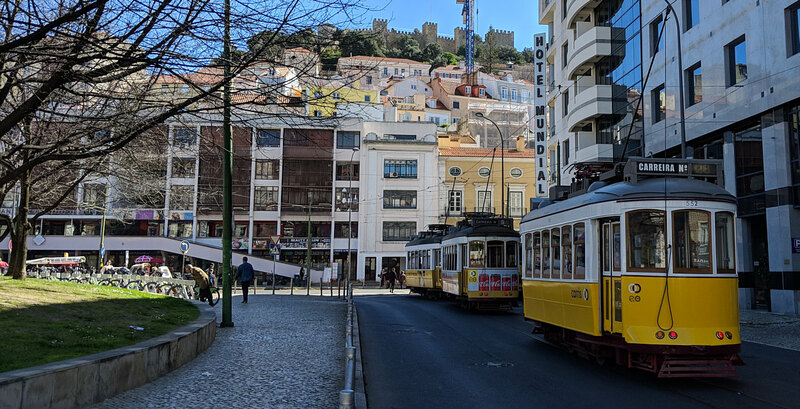 The route also connects with the funicular Ascensor da Glória. This "new" sixth route isn't mentioned much in the guide books when I visited in 2019 so you'll probably have no problem in getting a seat! I have created an animated map showing the development in the network between 1959 and 2018. Please scroll down through the photos of the remodelado trams. Route E12 is the shortest route on the system. 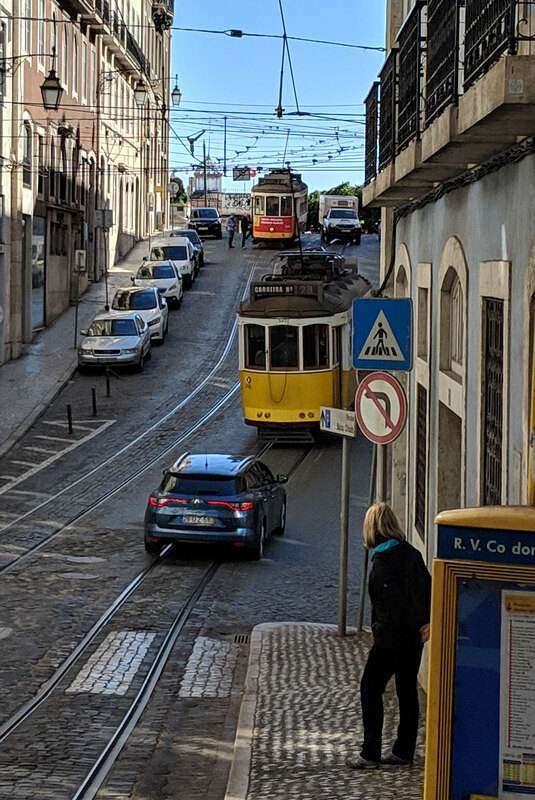 It runs through the very busy Alfama district removing some of the load from the busiest route on the network, the E28. Not so yellow - extra revenue is made from advertising! 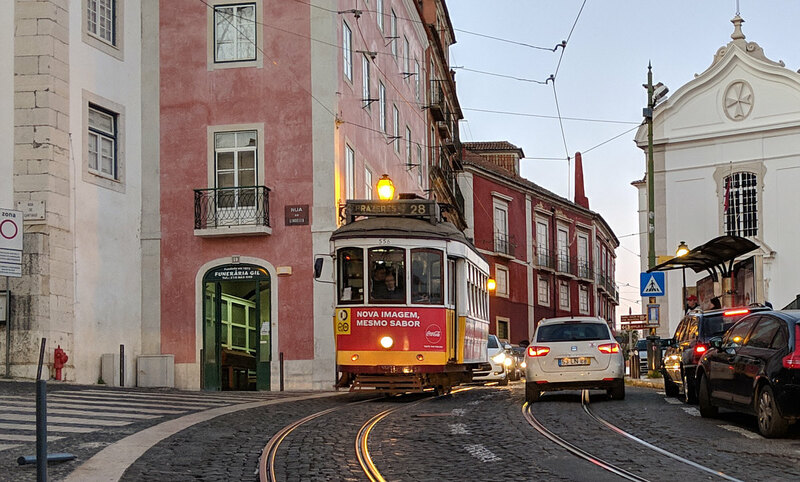 A nice view of a route 24E tram approaching the start of the route at Camões. 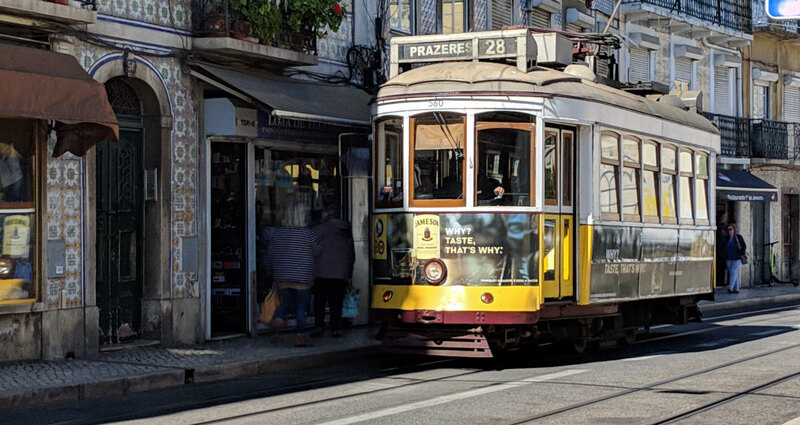 The turning point at Estrela where the red tourist trams and some 28E trams on a slightly shorter route start their return trip. 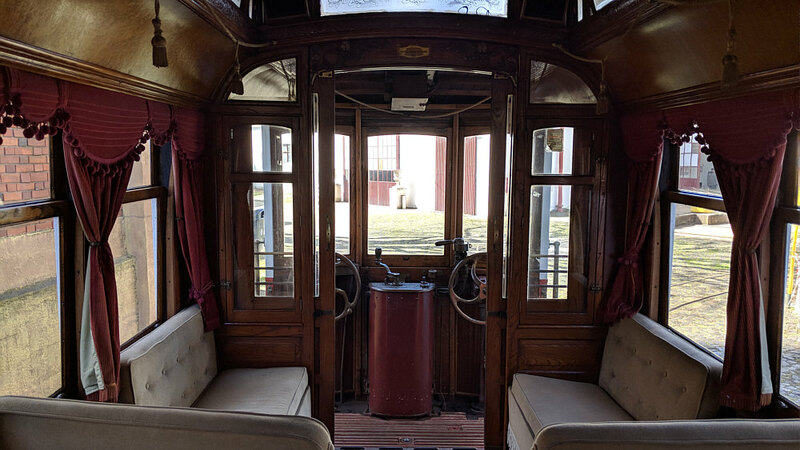 An interior view of the rear of a remodelado tram. And an interior view looking forward. A view of the Praça da Figueira where routes 24E and 15E terminate (with the 12E also calling). 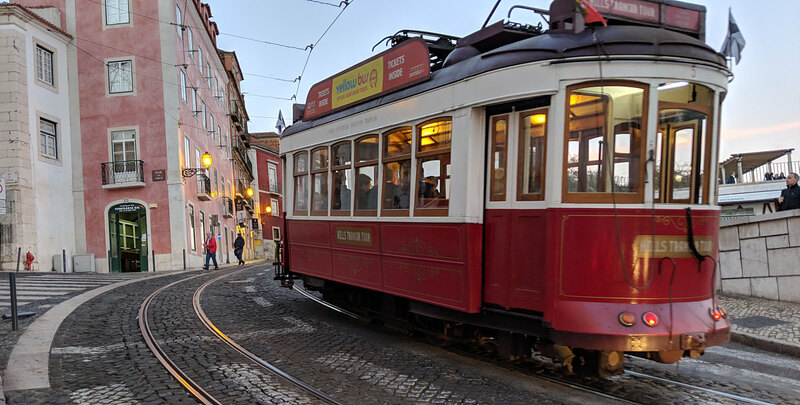 The red trams are run as a tourist hop-on hop-off service and are relatively expensive to ride. They share the tracks with the Carris (yellow) trams but use their own single circular route. .... but many are not. 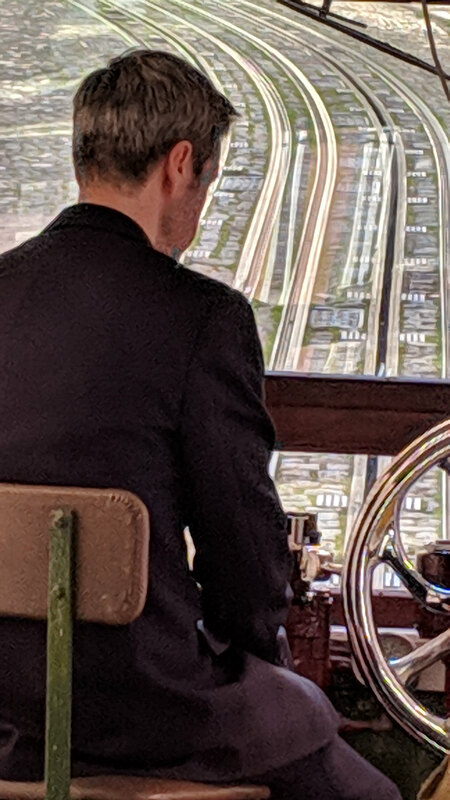 The tram driver here was worried that the footplate would damage this car's wheel / tyre. 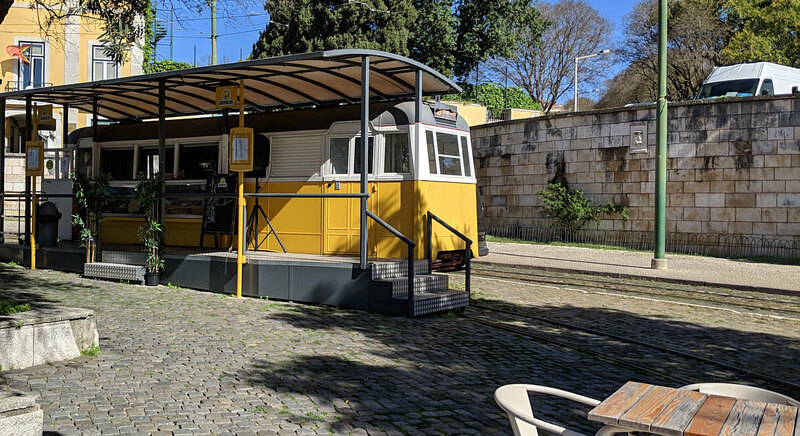 A cafe / bar made from an old tram in Belem. I didn't visit as I'd just had a coffee elsewhere but will next time I'm in Lisbon. 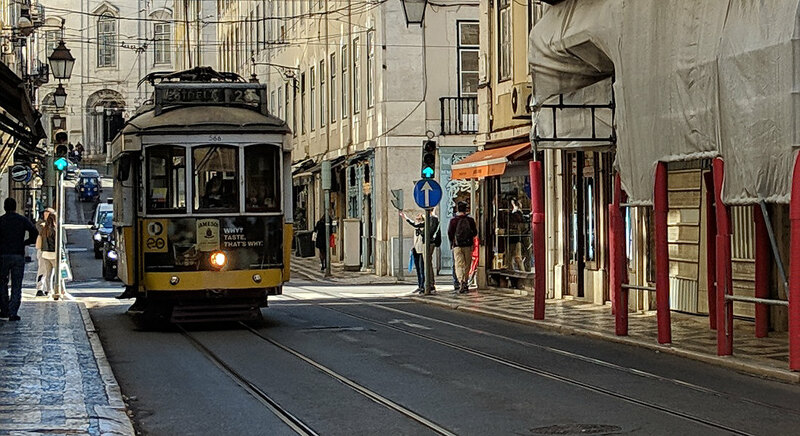 More red trams in Alfama. 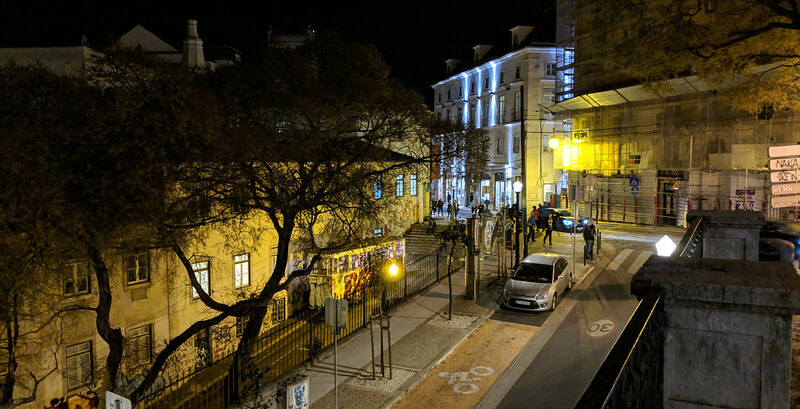 There are lots of restaurants in this area of Alfama. Finally the 28E service tram, appears!. 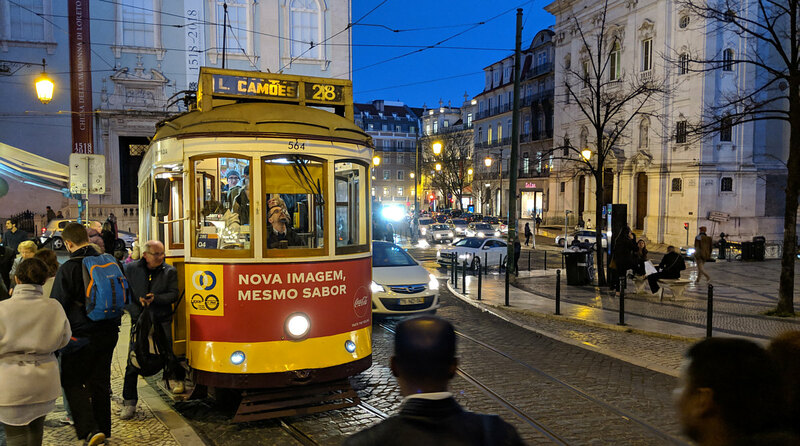 A night view of a 28E tram in Camões. The service remains busy through the evening! Compolide, the terminus of the 24E route (re-introduced in 2018 after 24 years). 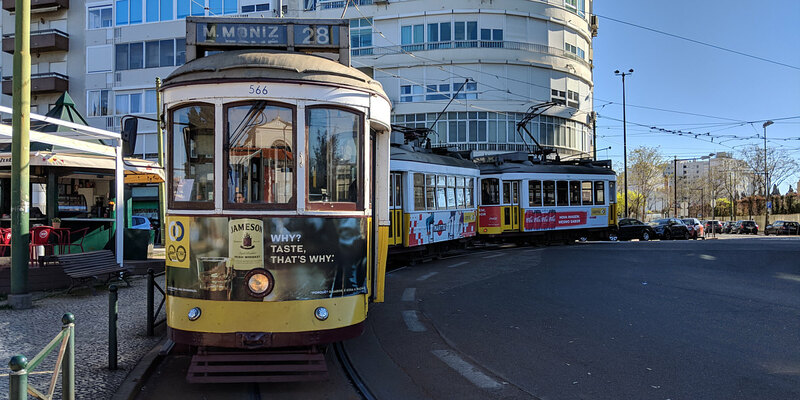 Lot's going on here; lucky these trams have good brakes! These older, vintage trams (which make up most of the fleet on all but one route) date from the 1930's although with new motors and control gear fitted in the 1970's. The trams draw up to 50 kW at 600 volts. 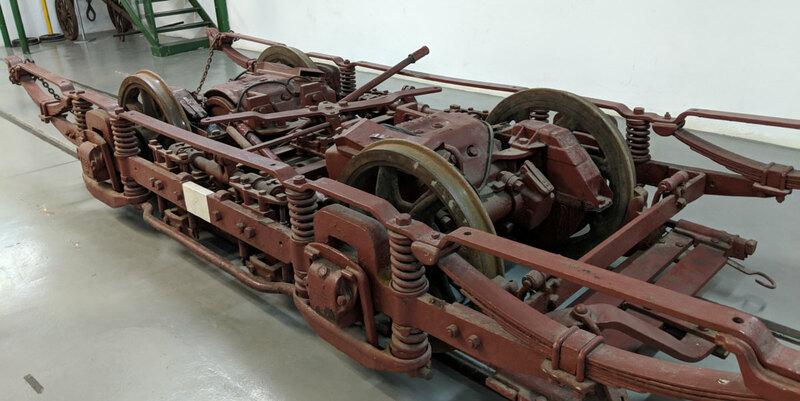 The track gauge is 900 mm (a fraction under 3 foot) which is classified as narrow gauge. The castle can be seen in the background. This is the terminus of 28E. While at the Compolide terminus, a bus rounded the corner and it's wing mirror hit the rear window panel. 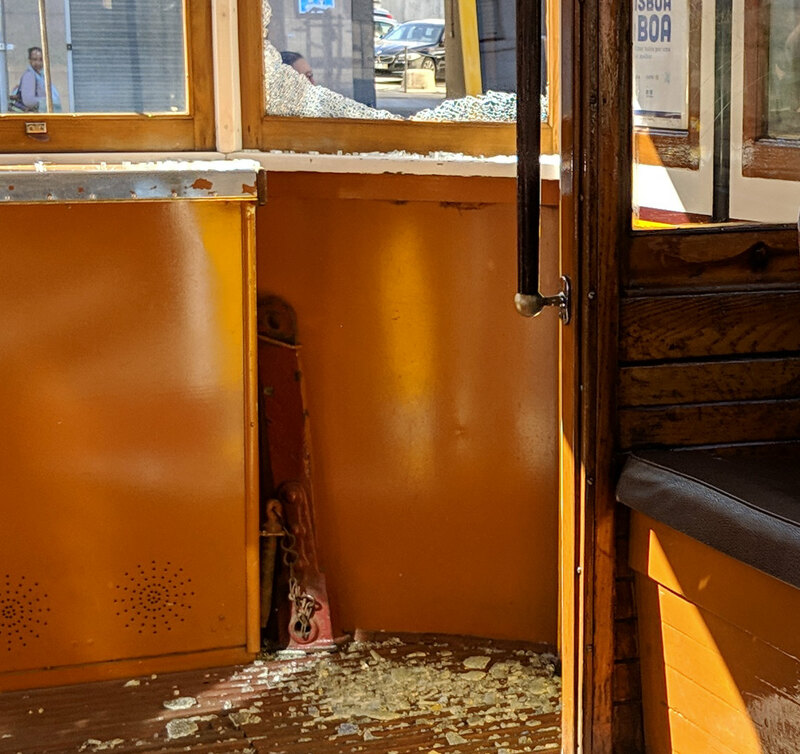 The panels are safety glass - it made quite a bang as the glass shattered but no one was injured although the driver of the bus appeared quite shaken. Route 28E about 6 minutes from its terminus. This view at the top of the Elevador da Glória (elevator/funicular). Route 24E at the Principe Real park. The start of route E24 at Camoes in March 2019. 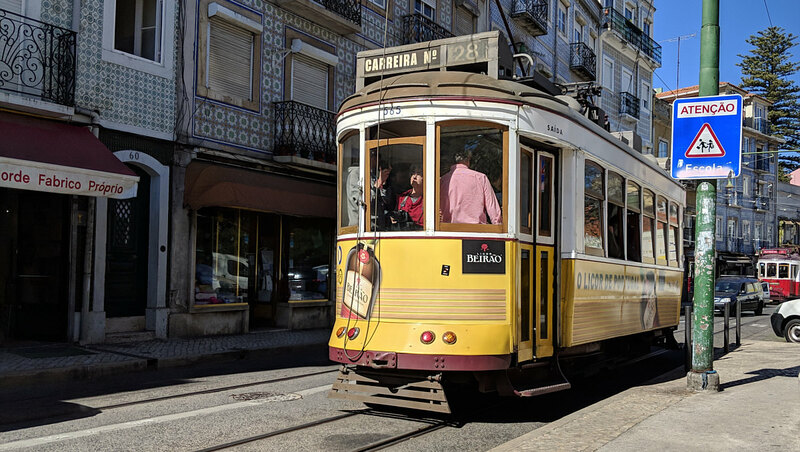 The route will eventually extend to the Cais do Sodre once repairs to the tracks are completed. Another 24E near the Principe Real park. The terminus of the E28 at Martim Moniz. A busy area at Camoes - the 28E runs through here while the 24E terminates. 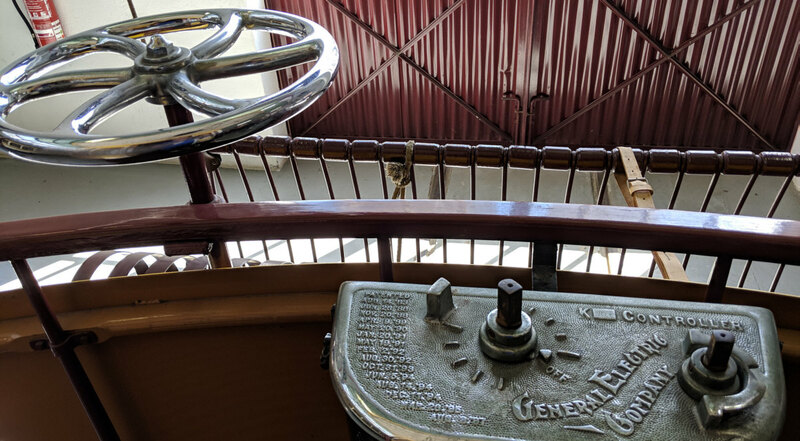 Please scroll down through the photos of the funicular railway (elevator). My photos are currently limited to just one railway. 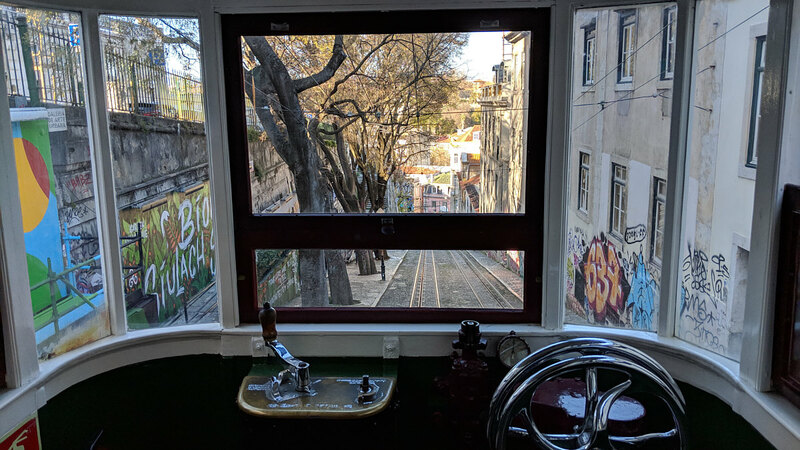 A view at the top end of the "Ascensor da Glória" funicular railway. The area is a showcase for street art. Another view of the top of this short railway. 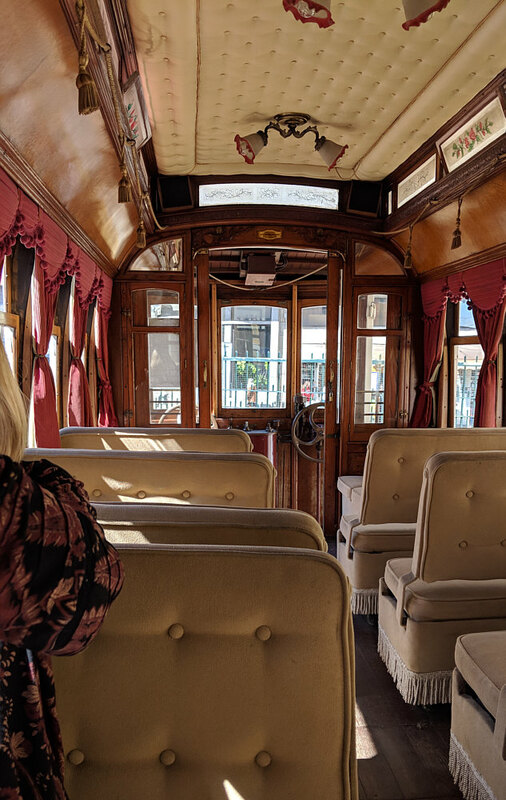 Dating back to 1885 and originally water powered, the tram was converted to electrical power with the current two cars in 1914. A view inside the car showing the drivers' position. The engines / compressors are Maley 234s. 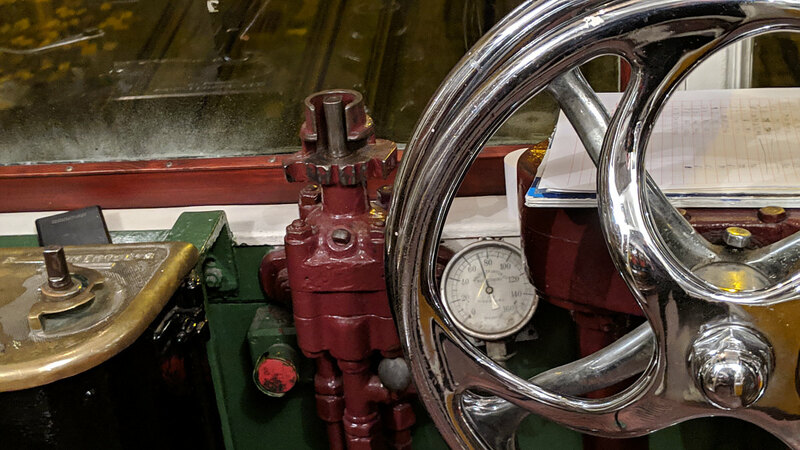 A closer view of the controls. Another view of the control gear. A dramatic view at the bottom end! The two tracks here (one dedicated to each car) overlap. 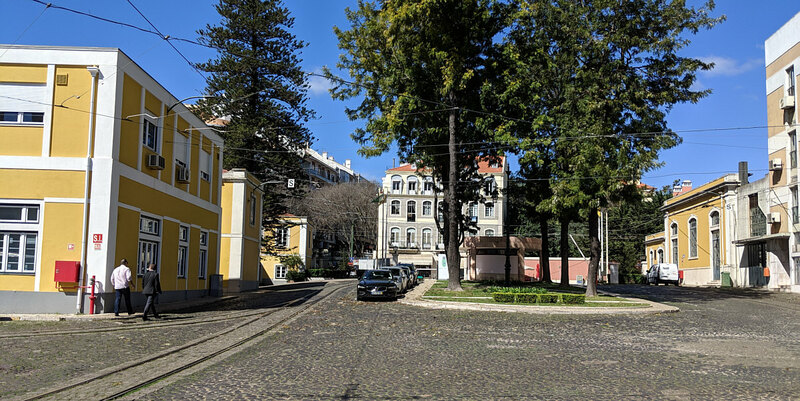 The route is from Praça Restauradores to S. Pedro de Alcântara (shown here) along the Calçada da Glória. 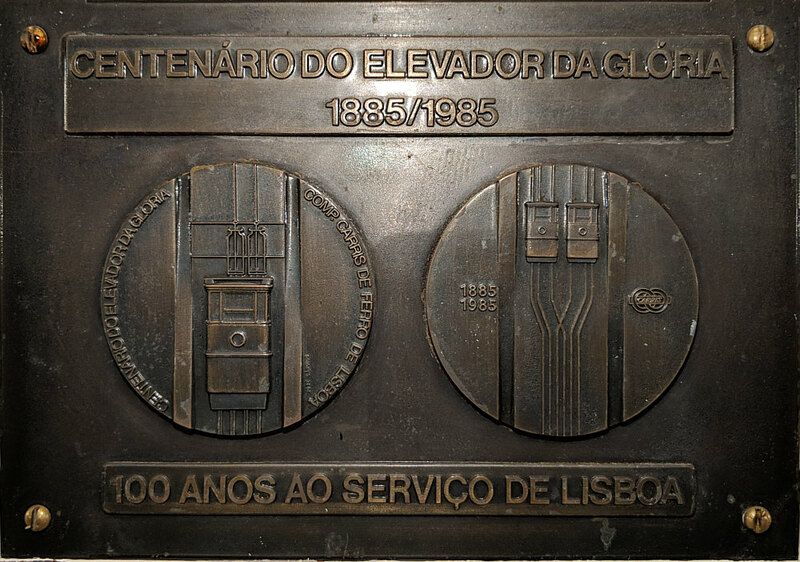 The Ascensor da Glória was declared a National Monument in 2002. A plaque on the wall of the tram celebrating the Centenary in 1985. An evening view inside the car. A view through the rear window. 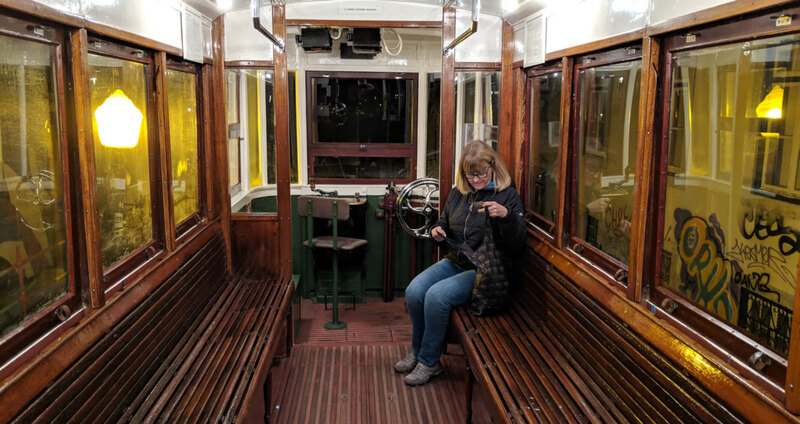 As well as the static exhibits, a visit to the transport museum gives you a short ride on one of the historic trams. The museum is adjacent to the Santo Amaro depot. Tram route 15E stops outside while route 18E stops within 200 meters. A horse-drawn tram dating from 1873. 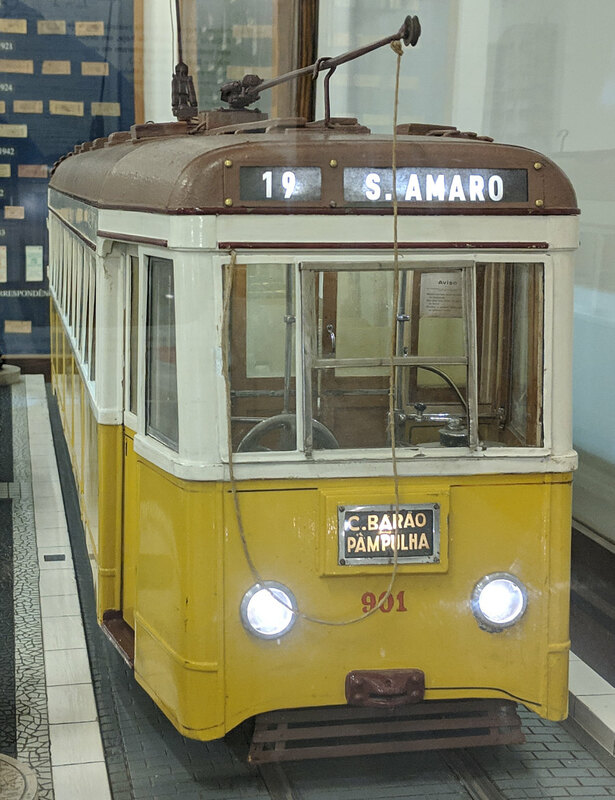 A model of one of the lightweight trams that sadly, didn't survive the pounding they got in Lisbon! Tram interior from one of the trams in the museum. The driver was outside and would have got wet in the rain and cold in the winter. This chassis shows just how small the wheelbase is. A tram in the museum grounds (which share space with the operational tram depot). Another view inside the depot. A dramatic view outside the museum / depot showing one of the massive bridge support towers. Purchase a ticket from the driver; relatively expensive and it helps to have the correct change. Purchase a card (similar to London's Oyster Card) from a Metro station and load it with money. 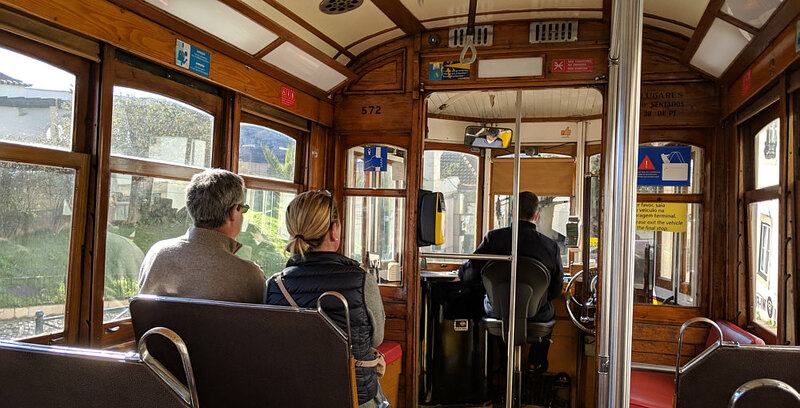 You can then ride the trams, buses and funicular railways until your money runs out. 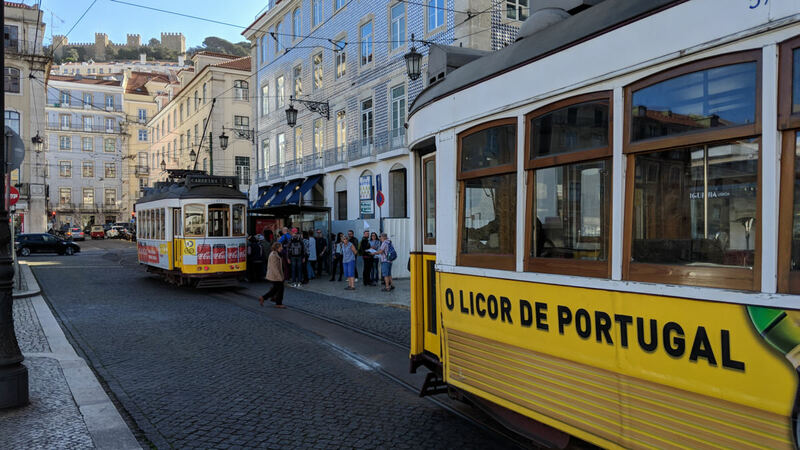 The cost per journey is far cheaper than paying the driver especially for the funiculars. Purchase a card and top it up with a 24 hour pass. This gives you unlimited travel within the 24 hours; the clock starts when you first use the card, not when you purchase it. The downside is that there is no way of knowing when your 24 hours expires without going to a metro and putting your card in the machine so make sure you make a note of the time of first use. One disadvantage is that you can't top up your card with another 24 hours until the first has expired. As you need a Metro station to top up, this could be inconvenient if your time runs out when you are nowhere near a Metro. On the other hand this method of payment gives exceptional value if you plan to make multiple trips in a short time. Pickpockets: You need to be aware that the trams, especially route 28 are targets for pickpockets; keep your valuables safe! 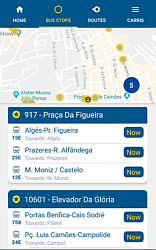 Travel App: Carris, the company responsible for running the trams has an App which will help you find the nearest tram (and bus) stop, provide details on routes and provide an indication of when the next service is due at any stop (although the App's reviews suggest this latter aspect is not always especially accurate).